If I were a minifigure, I would be fast to jump out of the way of this LEGO mech by Markus Rollbühler. 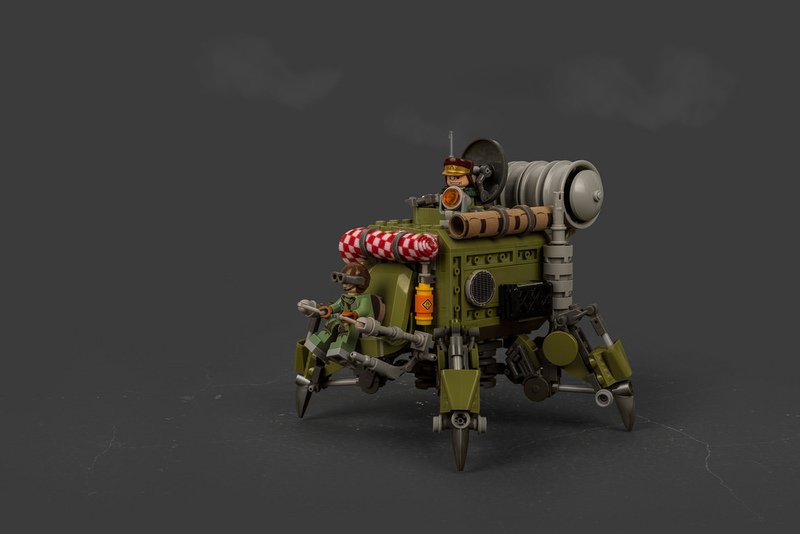 Markus drew his inspiration from a plastic model kit by Industria Mechanika. Markus carried over several characteristics from the kit while still remaining distinct and original with his design. For being a static model, I’m particularly impressed by how mechanical the finished build feels. In the mid-section, inverted plates expose the pins underneath in such a way that is reminiscent of rivets. Dark and light gray elements are mixed together to great effect, giving off the impression of working hydraulics. Other fun details include the driver’s outstretched legs and rolled fabrics, which could represent sleeping bags and/or tents. Meanwhile, the olive green color is a welcome bonus.